Sometimes you need to carry along more than just a toothbrush and a credit card. National Cycle's popular Cruiseliner™ Saddlebags make it easy to turn your bike into a pack mule for long trips or just around-town convenience. These durable, locking bags fit almost any cruiser using our model-specific Cruiseliner™ Quick Release Mount Kits. 1 N1101 Smoothback Saddlebags may be used if eliminating or relocating the turn signal stalks. 2 Models with OEM side-mounted license plates require the purchase of H-D Part Number 73279-10; License Plate Relocation Kit. 3 The Bad Boy is all black and the turn signal relocation bracket is chrome plated. Owners may want to paint this bracket to match the motorcycle. 4 The Fat Boy comes with a "shotgun" style exhaust. In order to use KIT-SB406, a low exit exhaust must be used. Staggered dual exhaust is OK. The turn signal relocation bracket will work, but the assembly method for the turn signals is different than the FX Softails and is not documented in the instructions. 5 Bag#884 (longer bolts) required when fitting P9BR500 Backrest Kit together with Cruiseliner Saddlebags. * Will not fit 2006 Screamin' Eagle Edition. 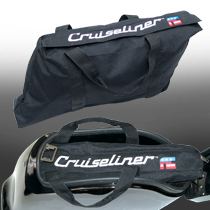 Cruiseliner™ Saddlebags are styled for cruisers. Unlike other bags, Cruiseliners are not bilaterally symmetrical – this enables a tight fit and streamlined styling that flows with the lines of the fender. Cruiseliner saddlebags open easily with a pushbutton lock that flips the lids forward for easy access to the 22-liter interior. The quality hinge permanently fastens the lids to the bags. The interior walls, lids, and seals are designed to keep the contents safe and dry. Two quick-detach quarter-turn fasteners are located securely inside the bags for easy, tool-free installation or removal. One key locks both saddlebags lids. Molded from an extremely durable polymer blend, then primed and painted gloss black. Custom painting is easy to do directly over the stock paint. Professional painters recommend a light wet sanding with 400 grit. Then you're ready to paint with any automotive type paint. Special Note: National Cycle manufactures Cruiseliner™ Saddlebags to mount to a stock motorcycle. All applications requiring the Pocketback style bags (N1100) can use a Smoothback style bag (N1101) as long as the motorcycle's turnsignals are changed or customized for clearance. Add Even More Cruiseliner Versatility with Inner Duffel Bags! Cruiseliner™ N1350 Inner Duffels are stitched to shape so they fit easily into the compartment of the hard bags. The generous size conforms to the inside cavity with room to spare. These well-constructed duffels are made from 600 denier polyester with a waterproof coating. A two-way zipper allows easy access in and out of the bag. These features, along with the sturdy nylon web handles, make it easy to remove and carry your items without removing the hard saddlebags from the bike. N1100 and N1101 Cruiseliner™ Saddlebags come with DOT-approved red reflectors. If you require amber reflectors, order N1102 or N1103. Cruiseliner Mount Kits are sold separately.